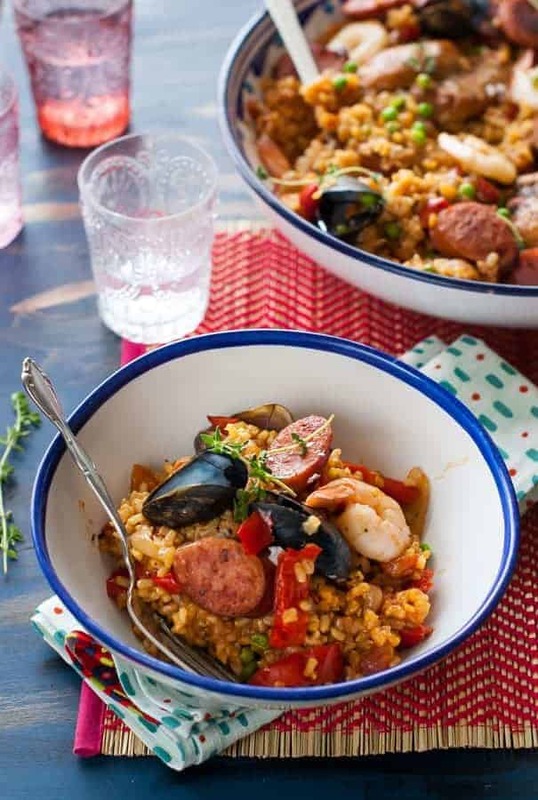 This healthy paella recipe certainly is delicious but the best part is that it’s also gluten-free, clean eating and dairy-free. 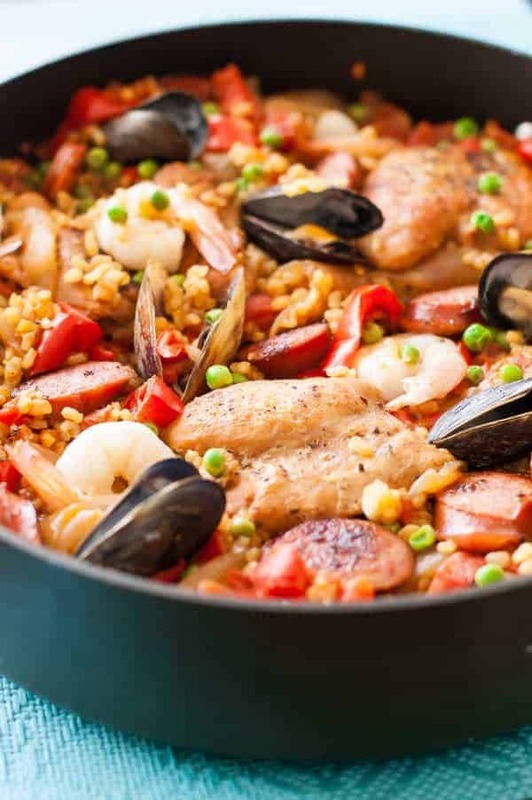 Now, when you look at the list of ingredients for this healthy paella recipe and see the amount of time it takes, you may not think it’s easy – but compared to regular, full-blown paella, it really is easy. Plus, really all you do is cook your proteins, add some vegetables and spices and cook the carb/rice in the same pot on the stovetop. But the best part is that it seems harder than it is and looks all fancy, so it’s great for a special dinner at home or for company or Sunday dinner. This is a really easy healthy paella recipe. There are so many different protein flavors in this dish. You’ll never get tired of it. 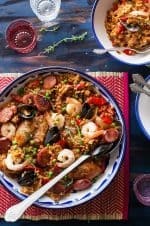 There are a few things I love about this easy Spanish healthy paella recipe – The entire meal is in one pot, there are several different types of proteins so you don’t get sick of any one type, the flavors from all the different meats and spices is really good, it’s beautiful and impresses family and guests and it’s different enough from American food to be different. Yet it has ingredients that are mostly very familiar to American cooking. I would think the saffron is the only ingredient you probably aren’t already eating. That could be left out. It obviously won’t be the same, but it’s still good. I love how it has a wide variety of meat and seafood and I love how it gets all flavorful from everything being cooked in the same pot with all the flavors melding together. You can also easily add or take away proteins. Heck, you can do it as simple as just chicken, although I usually at least throw in some sausage for extra flavor. You also don’t have to use ALL the proteins mentioned. I’ll often only use 2 or 3 of the meats because that’s what I have on hand and because this makes a lot and we can’t always eat all of it, and seafood leftovers just aren’t the best. If you haven’t tried short grain brown rice, you should. I like way better than regular brown rice. I haven’t tried this with quinoa, but it would be a very similar preparation. Do note that the liquid amounts in the recipe are really dependent on the heat that the paella is cooked at. You may need more or less water because every stove is different. When the paella is cooking, you will want to check the liquid levels, along with the tenderness of the rice. If the liquid is almost evaporated but the rice is still too firm, add a little more water or chicken broth. Make sure the liquid you add is hot, so it doesn’t take the heat down of the items cooking. This is one of the best things I have had in a long time. My family absolutely loved it. It is full of a large variety of ingredients that work well together. The flavor really comes out when you cook it properly! This healthy paella recipe has chicken thighs, turkey sausage links, shrimp and mussels. It also has peas, diced tomatoes, rice and lots of spices. This is a great recipe for a dinner meal. It is everything in one and you don’t have to have a ton of sides with it, pair it with your favorite type of bread if desired and enjoy! Please let me know if you try this recipe. I would love your input and would love to know any changes or substitutions you make. This simplified and healthy paella recipe is easy to adjust to different diets and add or leave out meat or seafood. I love making it for big groups of people because it has something everyone likes and looks so complicated and fancy, but it’s really easy. Heat 2 tablespoons of olive oil to medium/high in a large, deep frying pan. Season the chicken thighs on both sides with the salt, pepper, and dried oregano. Cook the thighs in the hot oil until golden brown on both sides. Remove chicken to a plate and cover. Add the sliced sausage to the same pan and broth the sausage slices on both sides. Remove the sausage and place with the chicken. Keep covered. Heat the chicken broth in a small saucepan, bringing to a boil. Remove from heat and add the saffron. Allow to infuse. In the same pan you cooked the chicken and sausage in, heat the remaining tablespoon of olive oil. Add the onion and bell pepper and saute until onion becomes translucent. Add the garlic, rosemary, and paprika and saute for another 30 seconds. Add the diced tomato and cook for another 2 minutes. Add in the rice and chicken broth. Bring to a simmer, reduce heat to medium and cover. Stir rice every few minutes. After about 35 minutes, start checking the rice for done-ness. If the liquid levels get too low, add a little more hot water or chicken broth to the pan, 1/2 cup at a time. When the rice is almost tender, add the peas, mussels, and shrimp. Cook for another 3-4 minutes, or until mussels have opened and shrimp is bright pink. Previous Post: « 9 of the Best Ever Keto Casserole Recipes – Cooking is Easy Now! I like your Paella Recipe. Its Amazing and healthy. I’m glad you like it. Thanks for stopping by! Looks Great, I’ll have to try it.